To celebrate the centenary of the birth of Agatha Christie, still by common consent the doyenne of English Detective Fiction, a team of her most distinguished descendants have joined in a highly original tribute. Leading members of the British Crime Writer’s Association have responded with ingenuity and enthusiasm to the challenge of producing stories set in the Golden Age of Detective Fiction – the period between the world wars. The crime scenes vary from country house to seaside hotel, from village fete to West End theatre – while the crimes themeselves are as bizarre and cunning as anything Hercule Poirot or Miss Marple had to deal with. The outstanding contributors to this volume are all in top form in this sparkling collection that is both an atmospheric trip through the corpse-littered world of the English Mystery’s Golden Age and a devilish affectionate salute to Agatha Christie – its undisputed queen. 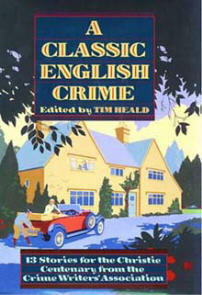 Soweit also der Klappentext von „A Classic English Crime“. Nachdem ich das Buch gelesen habe, kann ich sagen, er ist auch schon fast das kreativste und phantasievollste an dieser Sammlung.